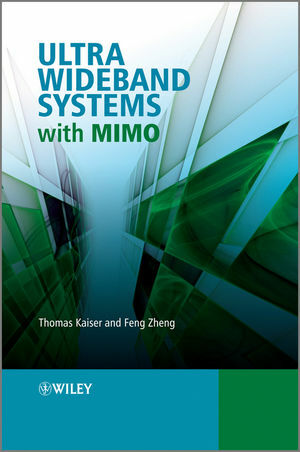 In this book, the authors investigate the benefits of combining UWB and MIMO technologies; highlighting five aspects of this promising research field: channel capacity, space-time coding, beamforming and localization, time-reversal transmission, and UWB-MIMO relay. The book presents a systematic and in-depth discussion for each of the hot topics, providing an insight into the cutting-edge research currently undertaken. It is expected that the ideas and approaches illustrated in this book will inspire sparks for the emerging technologies in short-range high data-rate wireless communications and other related applications. Professor Kaiser is the leader of the Institute of Communication Technology at the Leibniz University of Hannover, Germany, and is the founder and CEO of the spin-off company mimoOn GmbH. At mimoOn GmbH, he leads the scientific team to transfer the cutting edge signal processing algorithms combined with the up-to-date hardware, especially those for MIMO, into real products. Kaiser received the Ph.D. degree in 1995 with distinction and the German habilitation degree in 2000, both from Gerhard-Mercator-University, Duisburg, and in electrical engineering. Professor Zheng received the Ph.D. degree in automatic control in 1993 from Beijing University of Aeronautics and Astronautics, Beijing. He is now with Leibniz University of Hannover. He held Associate Professor at Chinese Academy of Sciences during 1995-1998 and Alexander-von-Humboldt Research Fellowship at University of Duisburg during 1999-2000. His research results on system and control theory are widely cited. From 2002, he has switched his research interests to signal processing, wireless communications and networks, especially on UWB and MIMO. He is one of the co-authors of the first paper on the channel capacity of UWB-MIMO systems.